This salad is not only delicious, it’s a breeze to put together. Why? 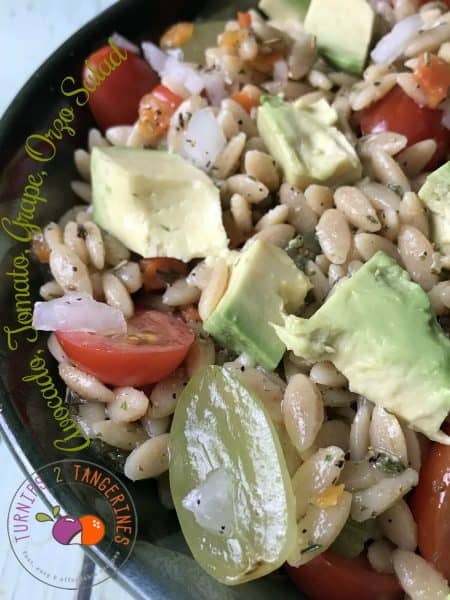 Because avocado tomato grape orzo salad is made with a boxed gourmet salad mix and a handful of fresh ingredients such as: avocado, cherry tomatoes and green grapes. An assortment of fresh flavors that blends beautifully with the boxed orzo & cucumber salad I purchased at Aldi. The boxed salad mix states, “You will need..” fresh cucumber and parsley. I didn’t have either, I was hungry so I went with avocado, cherry tomatoes and grapes instead. If you haven’t been to Aldi in a while, you really need to go back. If you’ve never been to Aldi, you need to check it out. Seriously. When I was a broke, single working mom, I would have been thrilled to of had the option to shop at Aldi. Especially with kids. Cereal and breakfast items, lunches and snacks are super inexpensive. Not only that, Aldi has baby food, almond milk, bagged salads, yogurt and so much more. They have a great selection of meats, produce and frozen foods. I haven’t even mentioned their specialty products! 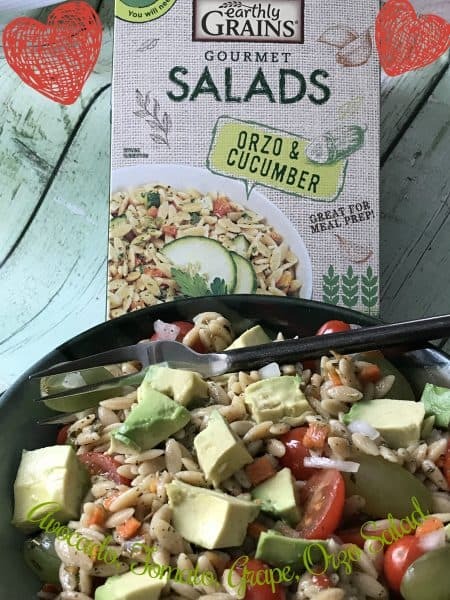 As I stated, I purchased this boxed salad mix at Aldi called: Earthly Grains, Gourmet Salads Orzo & Cucumber. 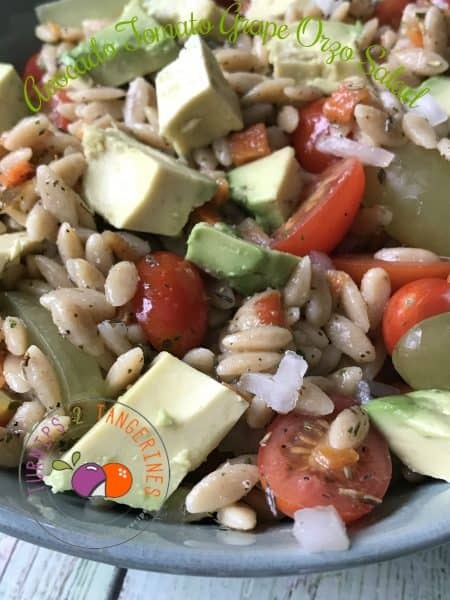 You could also make this salad using regular orzo, prepared according to package directions and toss with a simple vinaigrette. Personally though, I really liked the flavor of the seasoning packet that came with this salad mix. 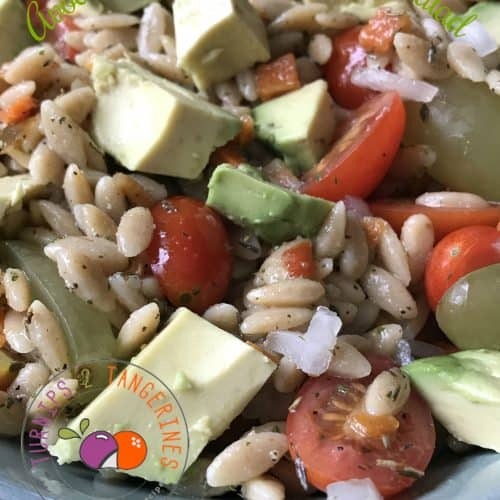 Purchase several boxes of Earthly Grains Salad Mix or any of the other varieties offered, and a fast and easy meal option is always within reach. 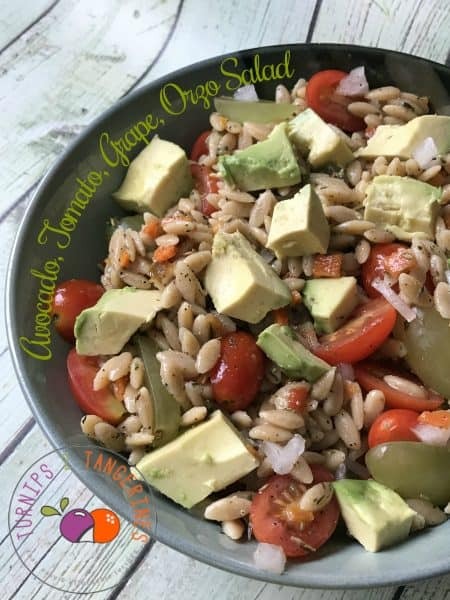 Avocado Grape Tomato Orzo Salad would be a delicious addition to any summertime picnic too. Many times you’re asked to bring a dish to pass and let’s be honest here, a pasta salad is always a welcomed sight. Everyone loves a pasta salad. Another plus, this salad isn’t made with mayonnaise or salad dressing, like so many other summertime salads. That means this salad can withstand the summertime heat and won’t need to be refrigerated. Weather it’s cold outside or warm, this salad will surely hit the spot. Recipe Note: Before serving, sprinkle the top of this salad with freshly grated Parmesan cheese. Make pasta: In a 3-quart saucepan, heat 8 cups of water to boiling. Add the orzo and vegetable blend, bring to a boil and simmer 8-10 minutes. Drain and rinse with cold water, shake well to drain completely. In a separate bowl, combine the seasoning mix, 1 tablespoon oil and 2 tablespoons water. Add orzo. Toss to coat with dressing. Refrigerate for one hour before adding remaining ingredients. Combine diced onion, sliced tomatoes and grapes with orzo. Refrigerate one hour. Before serving garnish with fresh grated Parmesan cheese. If your looking for super salad recipes, we have several you are going to love. Here they are: Spinach Salad with Warm Bacon Dressing and Bacon Blueberry Avocado Spinach Salad.